The United Nations, in collaboration with the GSMA, which represents the interests of mobile operators worldwide, and Project Everyone, a non-profit global campaign, today launched the Sustainable Development Goals in Action mobile application, which provides a global forum through which industry, governments and individual citizens can collectively realise the promise of the SDGs. “The Goals were adopted by Member States, but it is up to everyone – civil society, businesses and citizens alike – to achieve them. That is why the SDGs in Action mobile app is so timely. 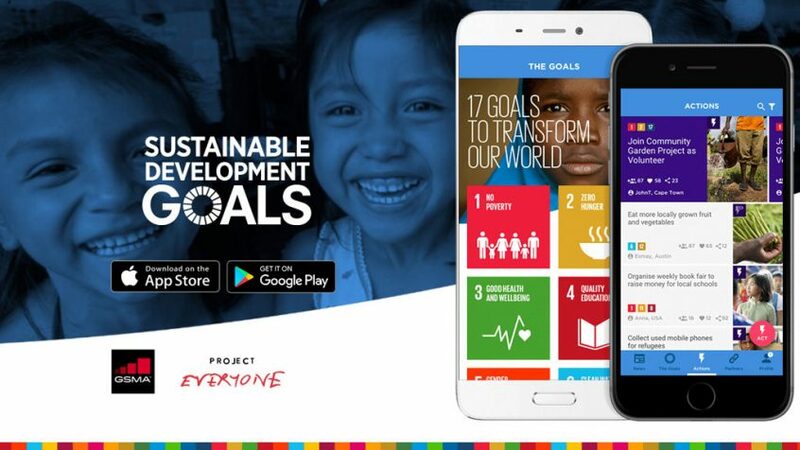 The app will bring the Goals closer to people and help make them more understandable and relatable to everyday life,” said Cristina Gallach, the UN Under-Secretary-General for Communications and Public Information. “The United Nations is pleased to be working with GSMA on a multi-year road map for cooperation and harnessing the critical role that the mobile industry can play in advancing the Goals,” said Under Secretary General David Nabarro, the Special Adviser on the 2030 Agenda for Sustainable Development. “It is critical to the success of the UN Global Goals that all citizens can have their voice heard and actively engage in playing a part towards the Goals being achieved by 2030,” said Richard Curtis, Founder Project Everyone, Filmmaker and Founder of Comic Relief. The UN provided detailed information on each of the 17 Goals for the SDGs in Action app, which also includes associated SDG targets, explanatory videos, key data, and suggestions on how people can take action to help achieve them. Project Everyone has created exciting and fun films in multiple languages, including an introduction to ‘The Global Goals 2016’, created by film writer and director Richard Curtis a series of original and interactive animations with the world’s most popular fictional character Mr. Bean the ‘World’s Largest Lesson’, introduced by actress and activist Emma Watson and ‘The Global Goals Mobile Show – the very best of Goals Week’, presented by YouTubers Estee Lalonde and Akilah Hughes, going out on mobiles globally at 6:00 pm EDT on Saturday, 24th September as a lead-up to the Global Citizen Festival that evening. The app is a dynamic, collaborative tool that puts a spotlight on how innovation is helping to achieve the SDGs. The app includes the latest sustainable development news from around the world, as well as case studies that illustrate the mobile industry impact in achieving the goals. Features such as sharing, likes, scoring and a leader board are designed to drive engagement with the app and increase global activity to achieve the SDGs. Users can tailor their experience based on the SDGs that are of the greatest interest to them and can sign up to receive notifications about those specific goals. Further, users can interact with others around the world, find nearby events to join in supporting the goals, and create ‘actions’ in their community and invite others to join. The app is available for iOS or Android devices. To download the SDGs in Action app and enjoy the exclusive content, visit: https://sdgsinaction.com/.